What is Naevus of Ota? Naevus of Ota is a colored skin markings of slate-brown or blue/grey coloring. 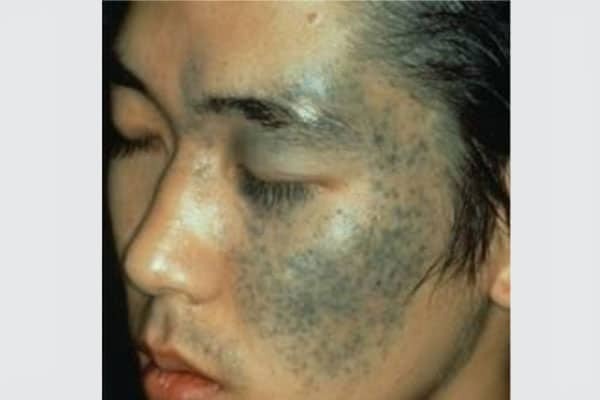 It is a unusual birthmark in which the melanocytes (pigment cells) are found deeper than normal (in the dermis instead of the epidermis). This is also known as dermal melanocytosis. Malignant Melanoma very rarely develops within dermal melanocytosis, and has usually been reported in Caucasians. Ocular melanoma has been reported in the choroid, brain, orbit, iris, ciliary body, and optic nerve in association with a nevus of Ota. How Do You Get Naevus of Ota and Who Is at Risk? It is not known why these naevus occur. Specific mutations have been detected within the dermal melanocytes. Naevus of Ota is common and is present at birth in 50% of cases but may appear during adolescence or adult life. Thus researchers suggest hormones play a part in their development. Treatment of a naevus of Ota is usually cosmetic camouflage to cover the disfiguring markings. Laser treatment (usually using 1064nm Q switched Nd:YAG or QS ruby laser) and intense pulsed light (IPL) work by destroying the dermal melanocytes. Multiple treatments are necessary, often with a combination of devices. Laser treatment is more effective in light skinned individuals than in those with dark skin. Unfortunately recurrence is common after clearance, sometimes resulting in a darker hue. If the eye is affected, arrange for regular eye examination to detect glaucoma. You should see a dermatologist if there is any change in the naevus, especially if you are fair-skinned.